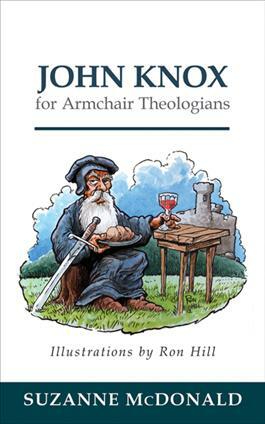 This volume in the popular Armchair series presents a short and reader-friendly introduction to the tumultuous life and theology of the fiery reformer John Knox. As leader of the Scottish Reformation, Knox notably came into conflict with the Roman Catholic Church, particularly Queen Mary. He was also an outspoken advocate for education and care for the poor, and is widely regarded as the founder of the Church of Scotland. Each chapter includes a description of Knox's activities as well as a discussion of key texts that introduce Knox's theological convictions. Expertly written by Suzanne McDonald, and featuring witty illustrations from Ron Hill, this book offers an intriguing introduction to the life and work of this major theological figure. Read the complete introduction by clicki ng here. McDonal d's lively account of John Knox's life, career, and writings helps readers see how the Scottish Reformer's tumultuous career shaped his theological outlook. Her engaging account, together with Ron Hill's illustrations, offers an irresistible portrait of a man whose strong sense of his vocation decisively transformed Scotland's religious history. Even more than most theologians, John Knox's writings can only be understood in the context of his life story. Suzanne McDonald has provided a splendid, accessible introduction to the twists and turns of Knox's life with an integrated summary of a number of his key works, including the ever popular First Blast of the Trumpet against the Monstrous Regiment of Women. Highly recommended for readers interested in Presbyterianism, international Calvinism, and Scottish history. McDonald's work on Knox offers a riveting read that aptly captures the complexity of a man whose turbulent life and inflammatory political writings have tended to overshadow his theological contributions to the Reformation era and his work as a prophet, preacher, and pastor. In a winsome way, McDonald has captured the content of Knox's thought in the context of his times. The most precious gem of the book is undoubtedly in the final section as McDonald highlights Knox's relationship with the "other women" besides the Marys thereby enabling the reader truly to get beyond the caricature of Knox to the real flesh and blood of the man.